Maths Driving You Crazy? Finding your way with maths is to many like navigating without Sat Nav, according to Sheila Quinn, Deputy Head Teacher at Greenleas School. In the old days as new drivers we started off with a map, or directions from Dad; then with a basic understanding we had fun exploring and creating a network in our minds of how all the roads where we lived connected. We went up a few blind alleys, took a few very long detours but eventually mastered the area where we lived. This gave us confidence to launch ourselves further afield. Our discerning knowledge would certainly be able to tell if the Sat Nav was telling us to drive off the end of a pier. This is a confidence or mastery of navigation. It is now 2018 and you have moved to a new town, you could just rely on your Sat Nav to get around but would you really be taking in where you are?. If the Sat Nav lost connection you could find yourself with only a basic recall of some of your most used routes, and if one of those routes had a road block you would be a little lost as you had never really developed an overall picture. You would perhaps wish you had adopted your earlier style of learning about your area and creating a map in your mind that related your surroundings. The original example of learning through exploring, demonstrates Relational Knowledge. The Sat Nav driver with only basic knowledge of their own is demonstrating Instrumental Learning. It is the former Relational Learning that leads to Mastery of a subject. This same philosophy of Mastery is how teachers in Shanghai, China have been teaching maths with great success and is now forming an interesting initiative for the Department of Education and the National Centre of Excellence in the Teaching of Mathematics (NCTEM) who are further investigating this approach towards Maths with a number of schools in England. 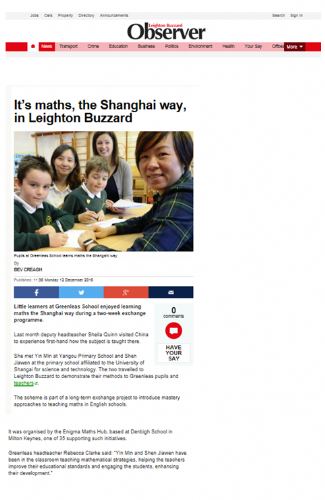 Exchange teacher visits thatare providing maths teachers in England with the opportunity to see first-hand how the Shanghai teachers develop mastery approaches to teaching maths in China. The teachers from England then host the Chinese teachers in their schools as they demonstrate this style of teaching to a sample of English pupils. The exchange is taking place within the Maths Hubs programme, which is coordinated by the NCETM and funded by the DfE. In July the School Standards Minister Nick Gibb announced £41m of funding over the next 4 school years, for various projects in the field of teaching for mastery. Greenleas School is working with the Enigma Maths Hub, which is led by Denbigh School in Milton Keynes. Deputy Head Teacher, Sheila Quinn from Greenleas School in Leighton Buzzard is one of 70 teachers that was selected from throughout England to visit Shanghai in November 2016. Greenleas then hosted two Maths Teachers from Shanghai later in the month. Mastering mathematics is a journey and, like our exploration as new car drivers, a long-term goal achieved through exploration, clarification, practice and application over time. It is not about just memorising key facts and procedures (or relying on technology!) as that leads to superficial understanding that can easily be forgotten, allowing you to get lost!